(90 minutes. standard corporate rate: RM1,000). 2. One Specialist 1 day "Employer Assessment Center" PowerWorkshop (standard rate: RM1,800). 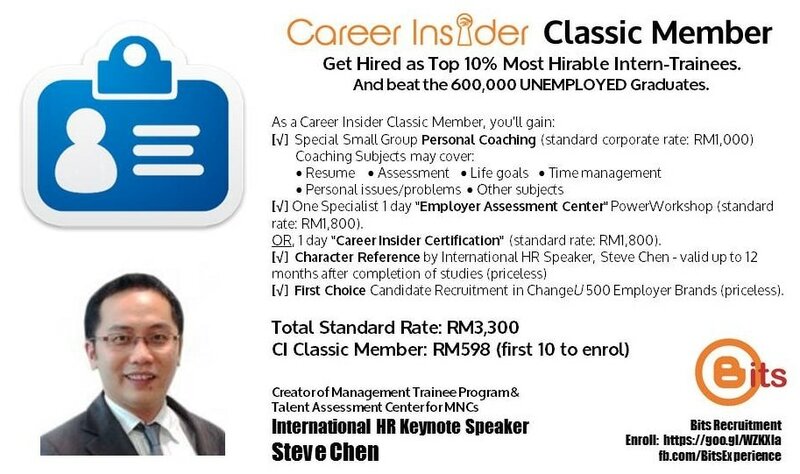 OR, 1 day "Career Insider Certification" (standard rate: RM1,800). 4. First Choice Candidate Recruitment in ChangeU 500 Employer Brands (priceless). 5. FREE admission to ChangeU Alumni for networking. Save at least RM2,700+ in this high value bundle. Apply today, to beat the 600,000 UNEMPLOYED Graduates Competition for the Best Intern-Trainee Positions.